I’ve sewn many of my own clothes over the years, and kept the leftover fabric, saying “Some day I’ll make a quilt of this.” I didn’t know how to make a quilt. I bought a book about quilts and admired all the complex designs. I had no idea where to begin. With this background it is surprising that I only discovered Project Linus a few years ago. Members of Project Linus make blankets of all kinds: fleece, flannel, knitted and quilted, for children who are ill or in times of stress. The local sheriff carries a bag of Linus blankets in his car because he never knows when the need will arise. Local agencies are glad to receive them. The local chapter is very active, but the supply never exceeds the need. 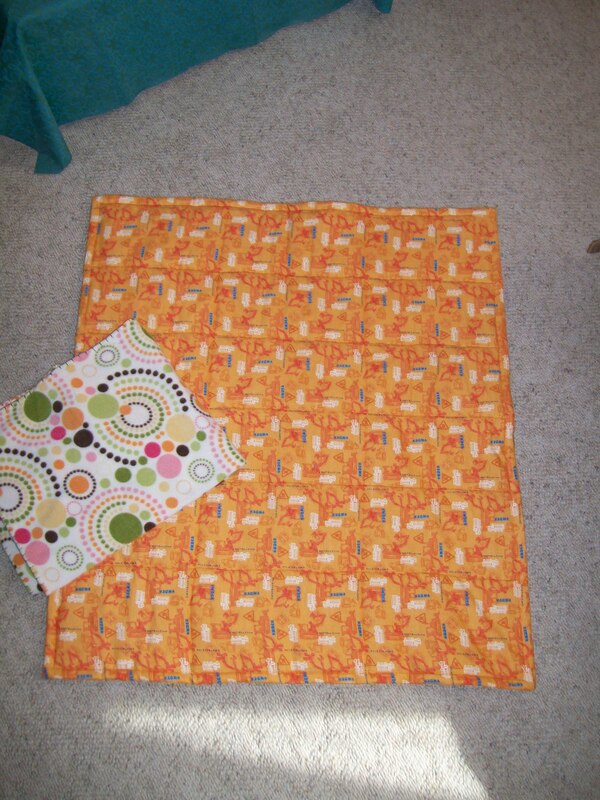 I began working with flannel, making small blankets for infants. The quilting part – stitching the layers together – isn’t difficult. 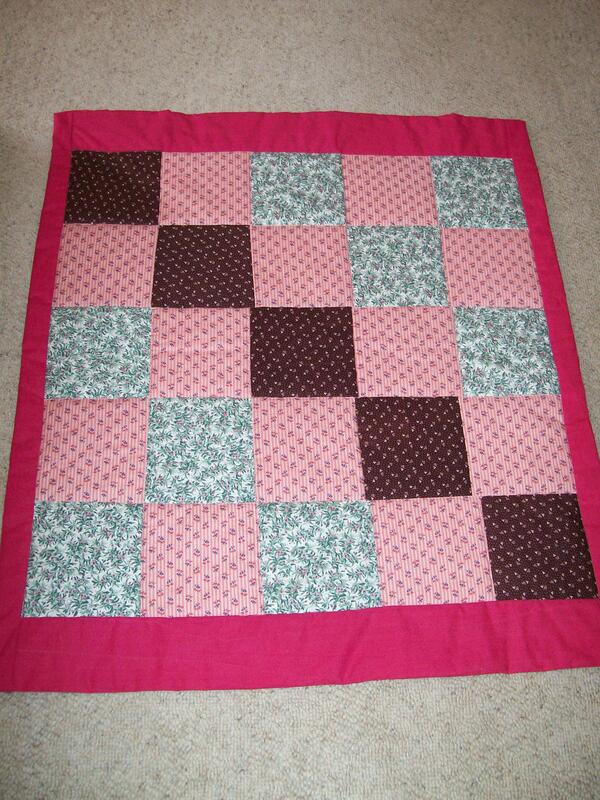 Gradually I learned to do piecing. Squares are still the easiest thing, but I did learn how to do triangles, which create diamonds. 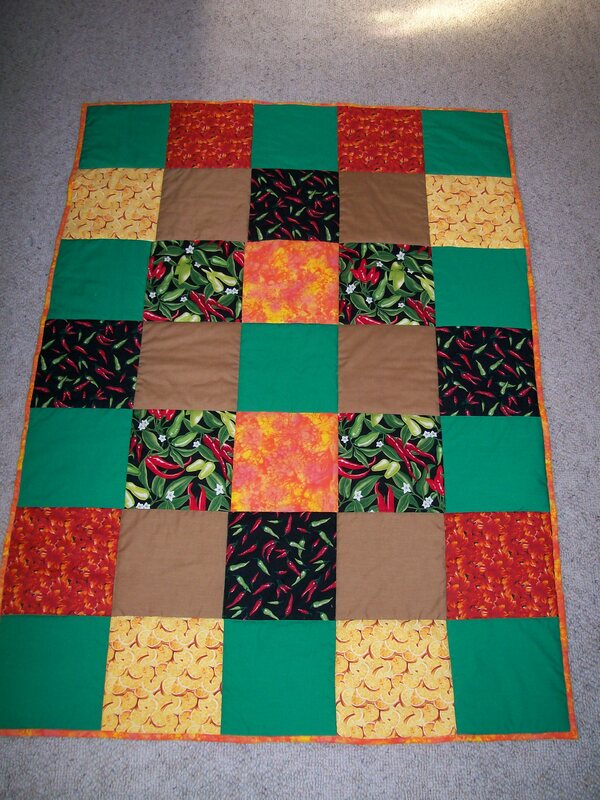 Gradually I worked with larger sizes, though I don’t have space to do full size quilts. What I like best is looking at colors and mixing and matching them. I’ll never win prizes for my quilting, but I take pictures for my own remembering, and decided to share them. Project Linus is easy to find at http://www.projectlinus.org. 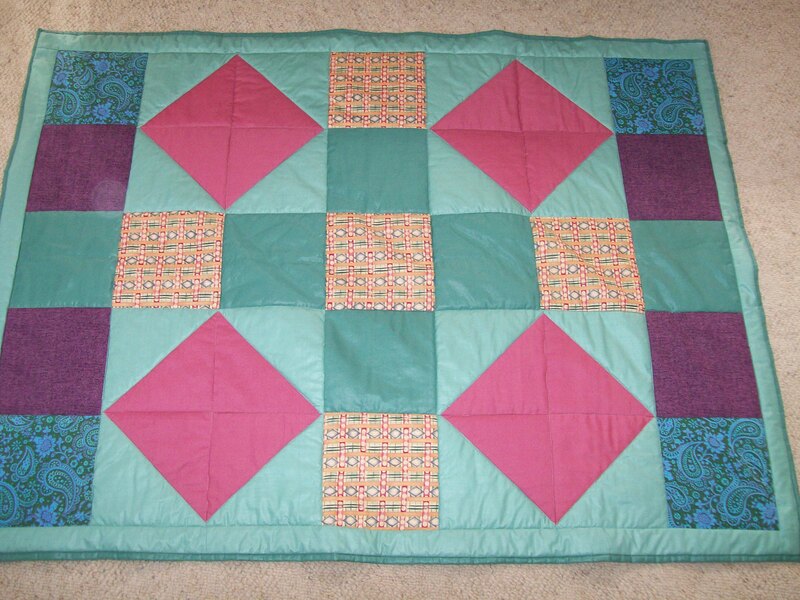 These quilts are very pleasing to the eye, especially the one with the mostly aqua background and border. Very nice, Ellen. I make them too but I don’t do pieces. I just sandwich batting between my colored top and plain backing and I stitch and tie them. It’s faster and you can make more. The Linus project started out making blankets to bury stillborn babies in. A lady had read that the hospital was burying babies in paper bags because they didn’t have the money to get blankets. The lady decided to make blankets and based on the Peanuts character who’s never seen without his blanket, she created the Linus project. It is a worthy cause. Thank you, Sandra and JoAnne, for your comments. I find working with fabric a good balance for the writing I spend most of my time on.